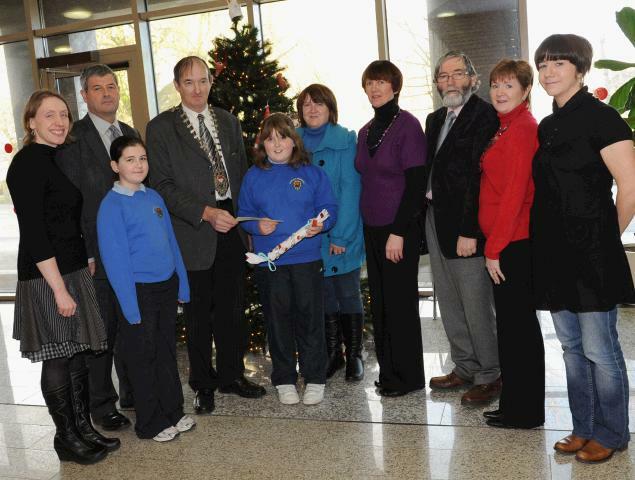 Cllr John Cribbin, Cathaoirleach, Mayo County Council concluded the year on a festive note when he presented prizes to the winners of the “Recycled Christmas Tree Decorations Competition 2009”. Hundreds of children around the County participated in the Christmas Tree Decoration competition for primary school pupils, which aims to get children and their parents thinking about how to reuse and recycle materials that might otherwise be thrown away. Ms. Mary Forde, Mayo Co. Co., Ms. Sharon Cameron, Env. Awareness Officer, Mayo Co. Co., Cllr. John Cribbin, Cathaoirleach of Mayo, Ms. Ceiligh Barrett – Corclough N.S., (winner), Lucy Barrett, Corclough N.S., Mr. Joe Beirne, County Manager, Mrs. Geraldine Barrett and Mr. Sean Barrett (parents). Photo Tom Campbell. Entries included decorations made from beverage bottles and cartons, cardboard and more unusual materials such as old socks, CDs, light bulbs and deodorant roll-on balls. 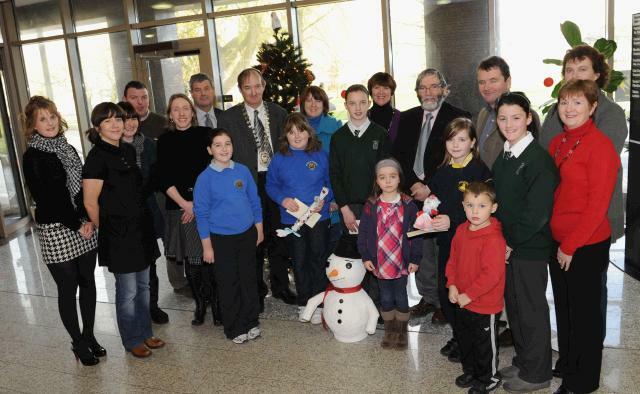 Management and staff of Mayo County Council with the three County Winners of the Recycled Christmas Tree Decorations Competition 2009 at the Christmas Tree located in Aras an Chontae, Castlebar. Winning schools – Corclough N.S., Belmullet, Mayo Abbey N.S., Claremorris and Lankill N.S., Westport. Photo Tom Campbell. “I am delighted with the imagination shown by the children in turning waste materials into beautiful decorations, this is the seventh year that Mayo County Council has run this competition and each year we see novel ideas and the most beautiful decorations” said Sharon Cameron, Environment Awareness Officer, Mayo County Council. Thirty schools throughout Mayo participated in the competition and one entry from each school was put forward to the Final. 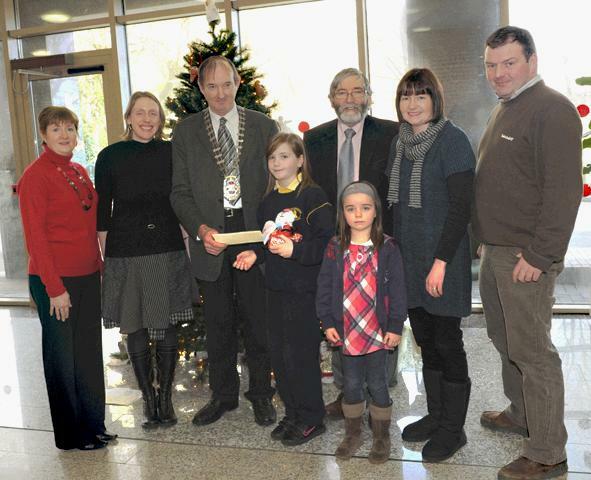 The entries were adjudicated by a panel from the Environment Section of Mayo County Council and the winning decorations hung on the Council’s Christmas Tree in Aras an Chontae, Castlebar. Ms. S. Cameron, Env. Awareness Officer, Mayo County Council, Mr. Seamus Granahan, Director of Services, Mayo County Council, Ms. Jessica Scahill, Mayo Abbey N.S., Cllr. John Cribbin, Cathaoirleach of Mayo, Ms. Niamh Mannion, Mayo Abbey N.S. (winner), Mrs. Madge Mannion (parent), Ms. Carmel Flynn, School Secretary, Mayo Abbey N.S., Mr. Joe Beirne, County Manager, Ms. Maura Murphy, Mayo Co. Co., Ms. Mary Forde, Mayo Co. Co. Photo Tom Campbell. Ms. Ceiligh Barrett, Corclough N.S., Belmullet with “Santa in his Sleigh”. Ms. Rebecca Lydon, Lankill N.S., Westport with her “Frosty the Snowman”.